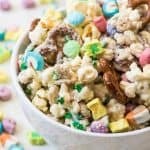 This magically delicious Lucky Charms Snack Mix has a rainbow of Spring colors and is a fun, sweet treat for snacking! Made with pretzels, M&M's, white chocolate, popcorn, sprinkles, and of course, Lucky charms, this is a hard-to-resist goodie that is fun for both St. Patrick's Day and Easter. In a large bowl, combine the cereal, pretzels, popped popcorn, M&M's, sprinkles, and peanuts, if using. In a separate bowl, carefully melt the white chocolate in short 20-30 second bursts in the microwave and stirring well between each burst of heat until the white chocolate is smooth. Pour the melted chocolate over the other ingredients and mix well to coat all of the snack mix in white chocolate. Transfer the mixture to the parchment lined baking sheet and spread out. As the white chocolate cools, the snack mix will firm up and set (about 10 to 15 minutes). When set, break into pieces and store in an airtight container. * I prefer the regular buttered kind but you could use kettle corn or another variety if you like. If you opt to use white chocolate chips, add 3 tablespoons of oil to them before melting. It will help them melt better and more smoothly since they have ingredients added to help them keep their shape and not melt as easily. Adapted from The Salty Marshmallow.